NEWS: We have our OFFICIAL Sponsor! I’m so pleased to announce that we have an official sponsor for Break A Record With Susan. 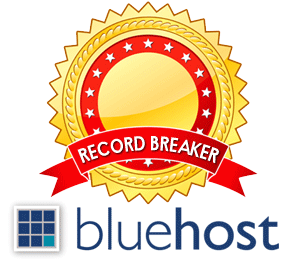 Yesterday, Bluehost, home of the most spectacular web hosting of all time, officially agreed to be our Record-Breaker sponsor! This is big news and it is super exciting to be associated with such a high-quality, well-regarded company. Bluehost offers web hosting packages that include unlimited space, file transfer, email accounts, free domains, incredible support, and free, instant setup. They’re trusted by millions, including me, as the best web hosting solution, hands-down. And they are exceptional when it comes to WordPress hosting. One of my favorite things about Bluehost is that their team is 100% in-house, here in the U.S.A., which means your emergency tech support phone call will never be routed to an outsourced call center. I really dig that. Plus, super-bonus, Bluehost is a great story of a small business turned mega-success. They started as a 4-person company and eight years later, employ over 300 people. Really impressive and really cool. I’m proud to be partnered with such a story of mega-success. So thank you, Bluehost! You totally rock! I use Bluehost the people there are great as well as the customer service. I know this must be an exciting time for you. Susan if there is anyway I can help out please let me know. I am a online life coach, motivational speaker, as well as the upcoming author of ” Now Is The Time” Get The Life Promotion You Deserved. Thanks very much! It’s nice to “meet” you!